Ever since seeing photos of Bordeaux, Washington state, online a number of years ago, I always wanted to visit this crumbling ghost town. Recently, I happened across some new images which suddenly showed a fair bit of graffiti, so I knew I had better visit sooner rather than later! Alas, what remains of Bordeaux, at least where there are no plants getting in the way, already does have quite a bit of graffiti, so I suppose I waited too long. Bordeaux was a logging town, and the majority of the shots in the gallery are of the old sawmill. 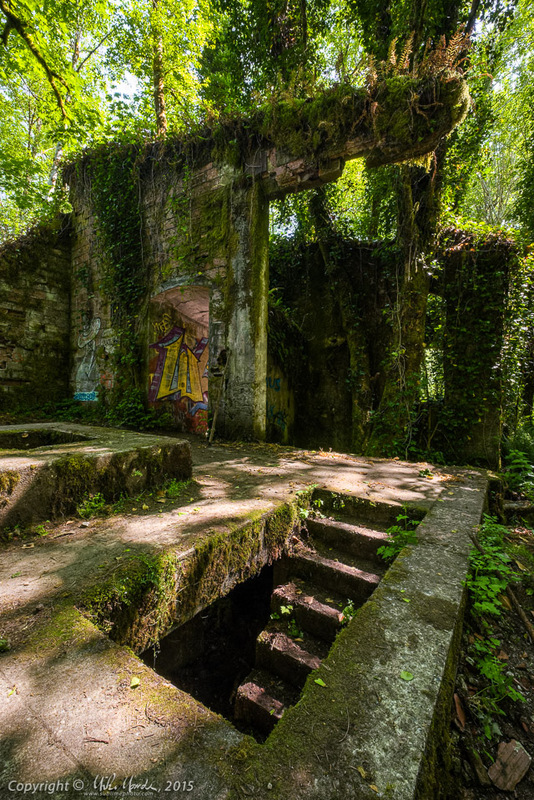 Most of what is left of the other buildings are either low, crumbling, overgrown foundations, or rectangular, bunker-like concrete structures. Photos 3 and 4 in the gallery are of the remains of an old smoke stack, but I didn't bother using shots of any of the other building remains since they weren't very interesting to look at. However the mill building is fascinating and I do wish I had gotten there before all the graffiti artists... and before all the slobs that have used the flooded, lower levels as a dumping ground for beer cans, pop bottles and coffee cups. There is an extensively researched article about Bordeaux, on the Dark Roasted Blend website, and if the history of the town interests you, I highly recommend the read.